Opelika, situated in East Central Alabama, is the county seat of Lee County and is bordered by the college town of Auburn to the west. As the principal city in the Auburn-Opelika Metropolitan Statistical Area (MSA), Opelika boasts a population of some 28,000. However, the Auburn-Opelika MSA is home to about 150,000 residents and has received many accolades in addition to being one of the fastest growing areas in the United States. Throughout the years, Opelika's economy has shifted away from textile manufacturing and has experienced a revitalization in several segments of the economy, including commercial, residential and industrial activity. Opelika has received several honors for its success in attracting new businesses. In a recent year, Opelika's Economic Development Department was named one of the top ten economic development groups in North America. The Auburn-Opelika MSA was recently named the "sixth best performing small city," the "seventh best small city for jobs," as well as many other recognitions and honors. Opelika is served by eight public school within the Opelika Public School System: three primary schools (prek-2), three intermediate schools (3-5), one middle school (6-8), one high school (9-12), as well as an alternative center that serves grades 6-12. The Opelika personal injury attorneys at Hollis Wright regularly help those in the Opelika and Auburn areas who have been injured through no fault of their own. Opelika, like anywhere in the state, is not immune to a variety of personal injury incidents, including car accidents, motorcycle incidents, dog bites, construction accidents, workplace incidents, defective products, medical malpractice and more. Contact us here for a free personal injury case evaluation. You may also call us at 205.324.3600 or 844.LAW.TALK. Should you sustain a personal injury caused by another party, you are likely entitled to compensation for lost wages, pain and suffering, permanent injury, emotional distress, medical bills, and other miscellaneous damages stemming from the incident. Don't let the insurance companies take advantage of you. The competent Opelika accident and injury attorneys at Hollis Wright will fight for your interests and ensure you receive any and all compensation you deserve. Our attorneys will aggressively advocate for each client and are willing to expend significant in-house and third-party resources, including investigators and experts, to help pursue your claim. Although many personal injury cases do not go to trial, the Opelika personal injury attorneys at Hollis Wright prepare each case under the belief that the case will end up in the courtroom for a trial. The attorneys at Hollis Wright have a combined experience of more than 150 years and are accustomed to handling cases involving complex and difficult issues. With any personal injury claim, it is truly important to ensure that you seek legal counsel as soon as possible after the incident. First and foremost, however, it is imperative that you initially tend to your physical injuries by going to a medical facility. Receiving medical attention as soon as possible is crucial for your health as well as for your potential case or claim. Maintaining contact with a physician is also important for your well-being and will provide your attorney the needed documentation regarding your injuries and your prognosis for a recovery. Additionally, your memory, as well as the memory of key witnesses to the incident, are obviously best immediately after the accident. It serves your case well to hire the personal injury attorneys at Hollis Wright soon after the incident. Our attorneys will immediately contact any witnesses and get recorded or written statements from them. This will ensure that there is an accurate and complete record of the details of the incident. Time limitations also exist for filing a law suit. All states, including Alabama have strict statue of limitation deadlines, which provide a time frame after the initial incident during which the lawsuit can be filed. When the statute of limitations has expired, you will not be able to file a law suit. 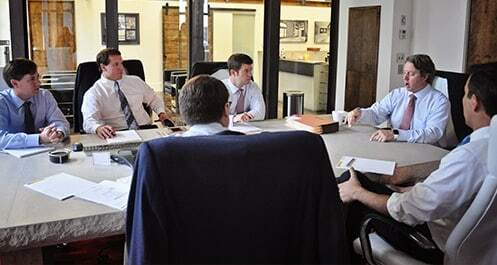 The trusted Alabama accident and injury attorneys at Hollis, Wright, Clay & Vail, P.C. work on a contingency basis, meaning we don't get paid unless you are compensated for your losses. If you or a loved one has been injured in any way through no fault of your own, please contact us here to set up a free and confidential consultation. You may also call us at 205.324.3600 or 844.LAW.TALK.